I didn't know if I had it in me or not to pull together a random roundup post before the long weekend, but alas here we are. I feel like a lot of the things I wore last week were super old, so I apologize many of these exact pieces are no longer available. But, for what it's worth, this is everything I wore last week! 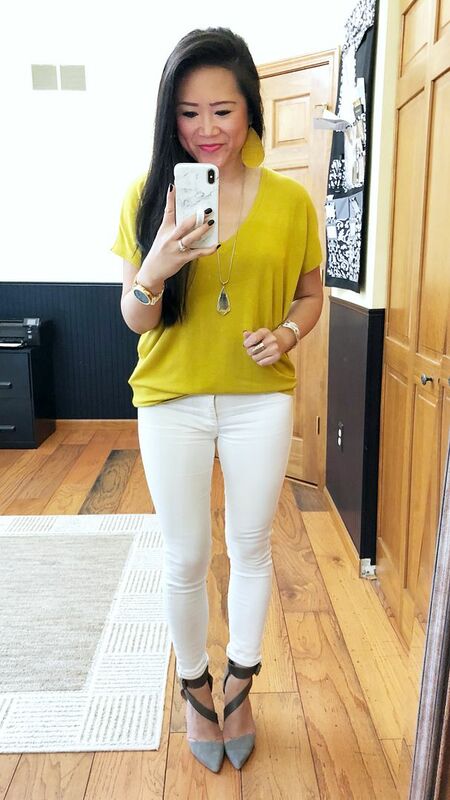 Earrings: Nickel & Suede in large Saffron Cord | Tee: Express V-Neck London tee in mustard | Necklace: Kendra Scott "Carole" (other colors here) | Jeans: American Eagle | Heels: Joe's "Ali"
I wore another London tee on the blog earlier this week - you can see that outfit here. I had really been wanting a basic tee in yellow because I have a new love for yellow this year. My tendency is to reach for black and leopard with yellow, so I decided to fight the urge and go for white and grey instead. 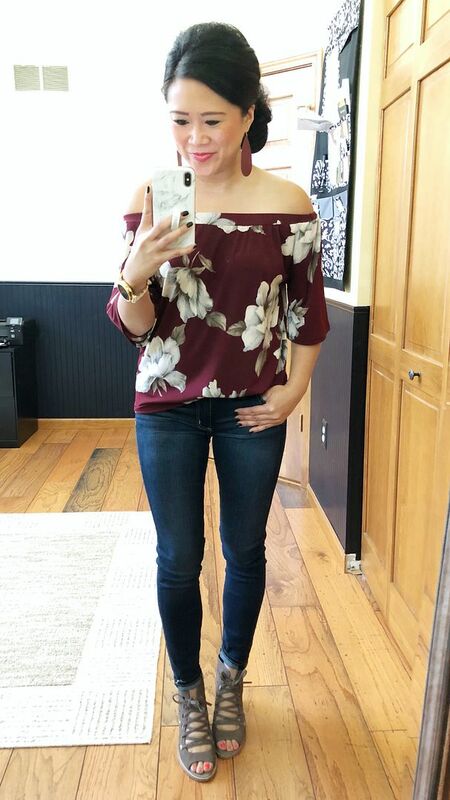 This is the same top I paired with the joggers in this post here except in a different color. When I was writing that post and linking to the top, Nordstrom had it on sale for half off. So. I basically had to buy it. 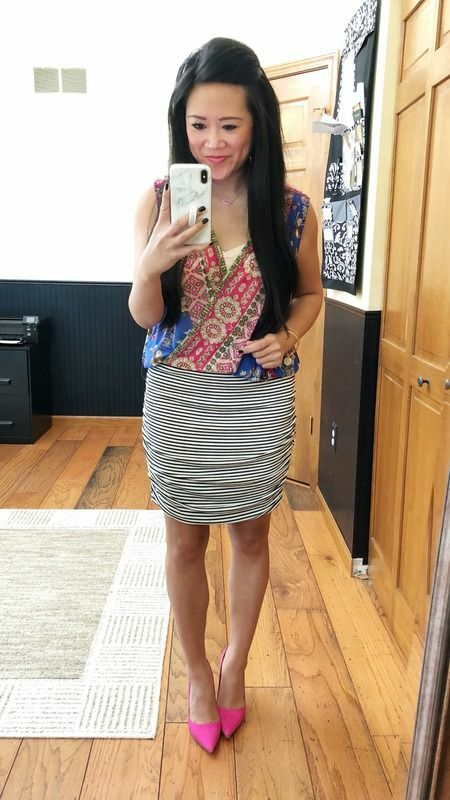 The print is fun, the fit is super easy, and it's so lightweight and perfect for warm weather. I loved the way it paired with the stripes! This is one of my favorite 'better-than-a-tee' shirts I own! And what's sad is that I can only think of one other time I've worn it! How is that possible if I love it so much! You can see the last time I wore it here. It's funny the things you discover when you're cleaning your closet room! When things are out of sight, they certainly are out of mind. But now that I know where this top is at again, I will be wearing it often. 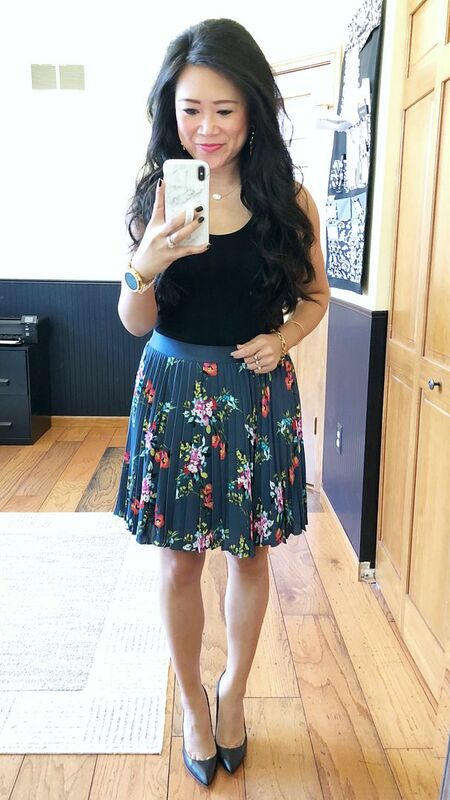 This skirt is an oldie but a goodie. It always gets me compliments when I wear it, so I wish it were still available for you guys. You can see when I originally wore it in this post here. And one more oldie but goodie. 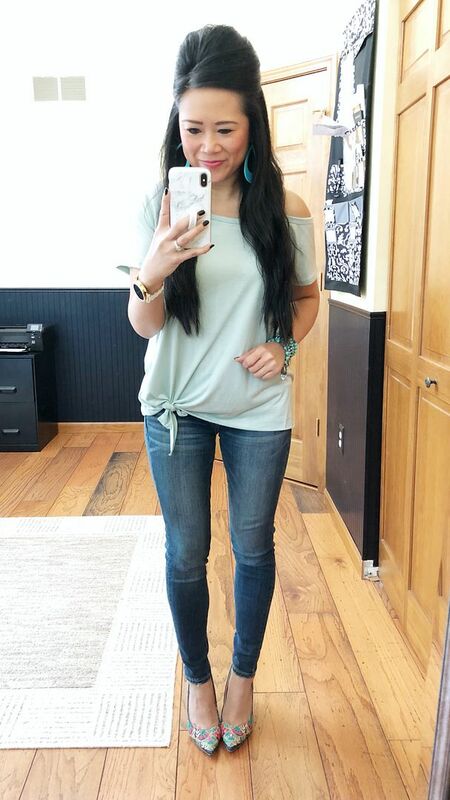 You can see the last time I wore this top in this post here. These shoes are a bit of a mystery to me. I found them in my closet room during the big purge, and it's quite possible I have never worn them before until now! They're so super comfy though and I love the lace up suede! Now that's what I call shopping my closet! OK I'm getting this Havana top, I don't have anything like that in my closet and the colors are so pretty. Oh, I am SURE you have worn the Tressa shoes, haven't you? I remember when you bought them! But maybe you just posted about them and didn't wear yet. Anyway, glad you remedied that situation! And as everyone told me on Monday's post, lots of people just love outfit inspo even if it doesn't involve shopping for the exact item. Me included! I just have an easier time remembering that for other people vs. myself.